I have had many discussions about tuning up Stella scooters; where to start? What do I recommend? So I thought I would write about it here. After a bit of riding on a 150cc machine, there is always the question, how can I make it go a bit faster? Note: This information can also be applied to Vespa PX150, P125 and P200E. There are different routes to take, but my first recommendation for some cheap power is a Sito Plus exhaust. Made by Leo Vince, the Sito Plus looks like a beefier version of the stock exhaust. It mounts up in the same location with very little problem. For the people worried about angering their neighbors, the exhaust is not much louder than stock, with a bit more of a “pop”. With an increase in jet size, you should expect more torque on the bottom end and a few mph on the top. The next step would be to increase the displacement of the engine through a cylinder kit. The four most readily available cylinder kits are from Polini, Malossi, Pinasco and DR. A cylinder, piston, head, wrist pin and snap rings are supplied with all of the kits for the Stella/ P125, P150. I have installed all 4 of these kits and they each have their own good and bad qualities. The DR 180 is the most similar to a stock cylinder, just larger. The ports on the cylinder match up very well with the engine case and make it the most durable kit of the four. The cast iron cylinder is also the least expensive cylinder upgrade available for the Stella. The 177cc kit from Polini is the next lowest in cost and needs a little bit more work to match the large ports of the cylinder to the engine cases. The Polini is designed for more low-end torque, and also adds to the top speed. The Pinasco kit is all aluminum with a hard chrome liner. The porting on the Pinasco matches up with the Stella with little to no porting necessary. It is a very nice kit, with great power. The drawbacks are the cost (it is the most expensive of the four) and, if the cylinder walls are damaged, it cannot be bored out. The Malossi cylinder kit has the smallest displacement at 166cc, but produces a lot of power. Work needs to be done to get the ports to match but you will be rewarded with a high revving, powerful machine. A weakness of the Stella is the small end bearing on the crank. With any of these kits, that bearing is more likely to fail. To protect the investment made in a cylinder kit, I recommend replacing the crank or even replacing the small end bearing. A Mazzuchelli crank- stock, cut, or full circle, is something that I also recommend. As one upgrades engine parts, more and more items that were once perfectly fine now hamper performance. Like not flowing enough fuel through the carburetor? Solution larger carb. The stock or Sito Plus exhaust is not “breathing” enough? Solution an expansion chamber. And, obviously, there are more things to upgrade than I can talk about in this column. 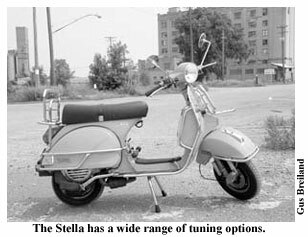 Solid, reputable information about 2-stroke engines can be found in A. Graham Bell’s book “Performance Tuning in Theory and Practice” and more Vespa/ Stella specific info in Norrie Kerr’s book “Tuning Vespas the Norrie Kerr Way”. Scooterhelp.com, scooterbbs.com and stellaspeed.com are unfiltered Internet resources that can also be of some help.